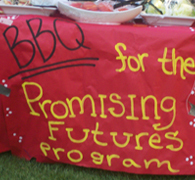 The mission of the Promising Futures Program is to develop a sense of community among first-generation college students at Chapman and to support the academic success of first-generation students through programming, including general meetings, study sessions, workshops, mentoring, and socials. A bachelor’s degree will provide you and your family with better opportunities and you will earn more over the course of your lifetime--$1,000,000 more than those with high school diplomas alone. 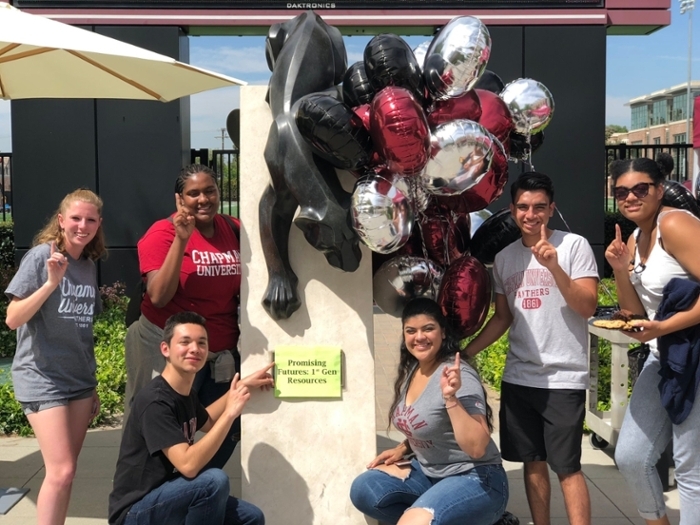 Your perseverance, resourcefulness, and hard work have helped you make it to this point and will serve you well during your time at Chapman and beyond! Through the Promising Futures Program we look forward to providing you with tips and insight on navigating your journey through higher education, since first-generation students may be entering with limited knowledge about the language and traditions of higher education and the resources available to facilitate your success in the university setting. Attend New Student Orientation – this will help get you connected to the campus community and resources from the very start. Please check out the Orientation website for more information and questions. Get Support – join clubs and organizations that are of interest to you to get involved and develop your support system on campus! Talk with people whom you trust, such as family members and friends, about what you are experiencing as you transition into the new college environment. Also seek out support from faculty/staff on campus to assist you! Utilize Campus Resources – we encourage all students to take advantage of all the programs and services available to assist you! Please visit the “Student Resources” section for web site links and more information about campus resources. Also utilize your fellow first-generation college students as a resource, since they have already navigated through this experience and are knowledgeable about all available campus resources! Find and Maintain Balance – while in college you will have a lot to juggle! Balance, organization, and time management will be key to your success. With your academic, social, work, and family responsibilities, it will be important for you to find a way to balance competing needs and obligations. Remember the hard work that got you here will also help keep you here. Ask For the Support of Your Parents/Family – since your parents did not pursue a bachelor’s degree, they may not understand what you are experiencing and the amount of time and effort you will be putting into your academics. Provide your family members with an idea of what college is like by sharing with them your daily activities and let them know how they can best support you! Get involved! Join clubs and do community service. Try not to be shy. Introduce yourself! There are people to help. It can sometimes be hard to find a sense of belonging, but don’t be afraid, because the Chapman community is welcoming. Get involved and you will grow so much. Use resources that are available to you. It’s important to be open-minded. Don’t be afraid to ask questions; if you are looking for help, you will find it. Not sure what classes to take? Want to stay on track for graduation? Interested in pursuing an internship? Want to develop and strengthen your resume? Questions about career exploration, the job search process, and more? Would you like an academic mentor to help you with time management and procrastination? Would you like to sign up for a tutor and take advantage of our tutoring and writing center resources? Interested in studying abroad? Would you like to travel and receive academic credit for these experiences? Interested in getting involved in a student club/organization? Interested in getting involved in civic engagement, service, diversity/social justice opportunities, and sustainability initiatives? Questions about living on campus? Searching for off-campus housing? Questions about your student academic record? Need to find the form to add a course from the waitlist? Requesting transcripts? Need transfer credit evaluated? Questions about your student account and billing? Questions about university policy? Interested in checking out the requirements for academic majors/minors on-campus? Health P.A.S.S. Program - this program through DesMoines University is a great way for promising first-generation college sophomores and juniors to prepare for and enhance their chances of getting into medical school and other health professions programs. The three-week program is high-quality, hands-on and FREE. Housing, meals, and transportation is provided to selected participants. ﻿Summer Undergraduate Research Opportunity Program (SUROP) at Kansas State University (KSU) gives undergraduates from under-represented groups, including first-generation college students, a first-hand experience with the research process. This experience is designed to help students prepare for graduate school and other advanced study. Participation in a program such as SUROP provides a first-hand look at the process and excitement of discovery through research and such experience is viewed favorably by the admissions committees for graduate and professional schools. This program provides selected participants with a stipend, travel costs, and housing/meals during the summer program. TELACU Scholarship Program - this is a scholarship program that low-income, first-generation college students are eligible to apply for and this program is more than a scholarship program as it provides resources to assist TELACU Scholars in their transition into college as well as in the workplace. CLEO Scholars - CLEO (Council on Legal Education Opportunity) is a nonprofit entity of the American Bar Association whose mission is to diversify the legal profession. The CLEO program offers great programs and resources for our pre-law first-generation college students. Summer Undergraduate Research Fellowship (SURF) Program at Chapman - this is a great opportunity to have a paid summer fellowship on campus with a faculty member in addition to professional programming, social events, and other activities designated for this group of SURF participants. This program is a great opportunity for students interested in pursuing graduate study and research. Amgen Scholars - this program has the goal of increasing learning and networking opportunities for undergraduate students committed to pursuing science or engineering careers with an interest in pursuing a Ph.D. or M.D.-Ph.D.; and to spark the interest and broaden the perspective of undergraduate students considering scientific careers. Sophomores, juniors, and non-graduating seniors are eligible to apply. There are several host universities that students can apply to. Promising Futures Program students are pursuing great things including studying abroad outside of the U.S., taking on leadership roles in clubs/organizations on-campus, going on to pursue graduate study, and lots more!